The transmission of a disease by insects, rodents, etc. Conveying or causing a disease. 1. The physiological processes associated with disease, injury, or disordered function; the study of such processes. 2. The disturbance of function that a disease causes in an organ, as distinct from any changes in structure that might be caused. 3. Deranged function in an individual or an organ that is due to a disease; a pathophysiologic alteration is a change in function as distinguished from a structural defect. Determining the form of a disease. A tendency to magnify the importance of one's disease. 1. A speech, figure of speech, or rhetorical device aimed to stimulate the passions. 2. The excitation of passion by rhetoric or poetry. The causation of disease; the tendency of an individual to become ill. The psychology of mental diseases. A psychosis involving bodily functions; such as, those arising from organic diseases, including brain tumors, encephalitis, etc. A quality that arouses feelings of grief, sympathy, tenderness, or sorrow: Pathos and compassion have in common the idea of tender emotion that is caused by suffering or distress. 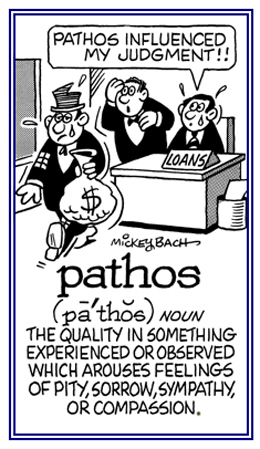 Pathos is a quality, as in literature and art, that arouses feelings of despondency or hopelessness. Any kind of diseased condition. 1. The therapeutic use of earth or mud to cure a disease. 2. The application of peloids; such as, mud, peat moss, or clay, to all or part of the body. Any disease of the pharynx. Showing page 22 out of 29 pages of 435 main-word entries or main-word-entry groups.